Congratulations to Affinity Consulting from Tabs3/PracticeMaster! 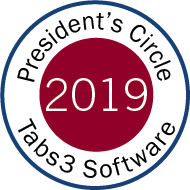 In mid-January, Software Technology, LLC announced the members of the 2019 President’s Circle for Tabs3 Software. President’s Circle members are selected annually based on their expertise with Tabs3 Software, their strong client relationships, and their sales. Affinity Partner Britt Lorish accepted the awards on behalf of Affinity's Time, Billing and Accounting Team. "We are always delighted to be selected for such prestigious recognition of our hard work. It means that we are providing the best care and service possible to our clients," Britt said. "That's the most important part of this acknowledgement for us." To find out more about Tabs3 and the other great products by Software Technology, LLC, contact info@affinityconsulting.com. Software Technology, LLC is a leading provider of legal software in the United States with 40 years of experience and more than 100,000 active legal professionals using its products. Their three product lines, Tabs3, Kurent, and CosmoLex, offer billing, accounting, and practice management features for solo to midsized law firms in both cloud and desktop environments.